Here’s something you may or may not know about me. I am not a mother that takes some time for herself now and then. I don’t go away, or even take a day, for myself, here and there. Most times, I don’t even just go shopping, without taking some or all of the kids with me. I just don’t care to be away from my kids. I like their company. I understand some mothers do like to go away, or take a break from their kids now and them. I’m betting that is normal, and I know there is nothing wrong with that. But it’s just not what I do. But the other day, I went to visit a good friend. She is only one of a few real-life friends I have. I only see her once in a blue moon, and I hadn’t seen her in way too long. She lives very close by, so you would think I’d be able to see at least a little more frequently, even as busy as I am. But you see, every single time we have ever gotten together for ‘just a cup of tea’, it has pretty much turned into an ‘all day affair’. She is SO down to earth, so funny, so easy to talk to, and listen to, that the hours always seem to just slip right away. Literally. So we met the other day at her house, just for a cup of tea, or a glass of wine, at 1 p.m. in the afternoon. I got home at 9 p.m.
It’s pretty much a pattern now. Complete with Michael’s phone call somewhere in there, asking, “Is my bride ever coming home again?”. At the end of our visit, we stood in her front doorway for another hour+, chatting some more. It’s ridiculous. I love her to death. So what does that have to do with food and recipes? You came to talk about FOOD, right? Well, the link is that of course I stayed for dinner, at my friend’s. She said she was having scallops. 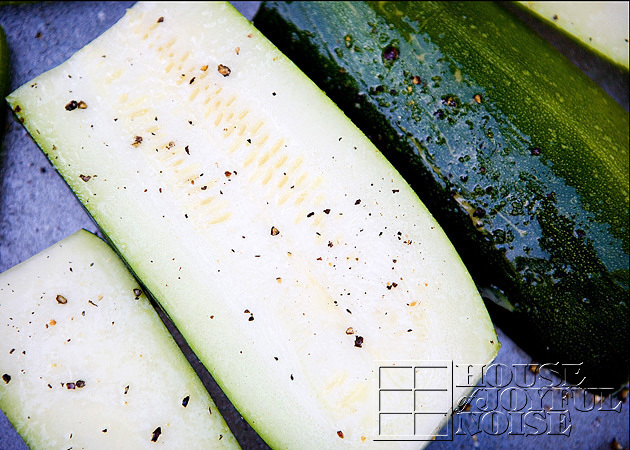 I had brought her a summer squash and zucchini from my gardens. ; ) I learned she calls scallops ‘sea candy’. She showed me how she prepares her scallops, and zucchini. Both, on the grill. I was intrigued. The dinner, was DELICIOUS. This is pretty how she prepared the dinner. 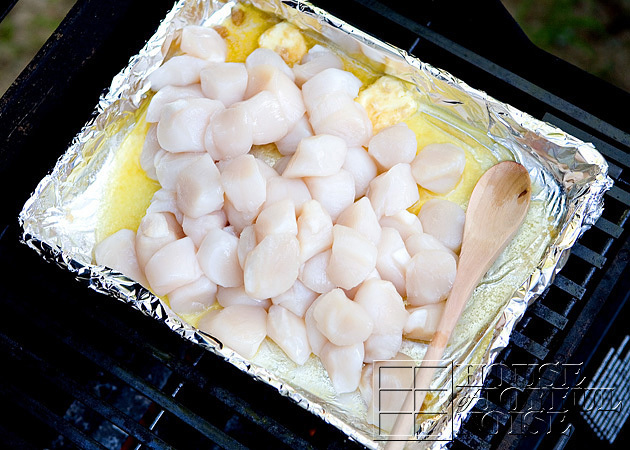 But her reference of the scallops as ‘sea candy’, gave me the idea of adding a little ingredient. 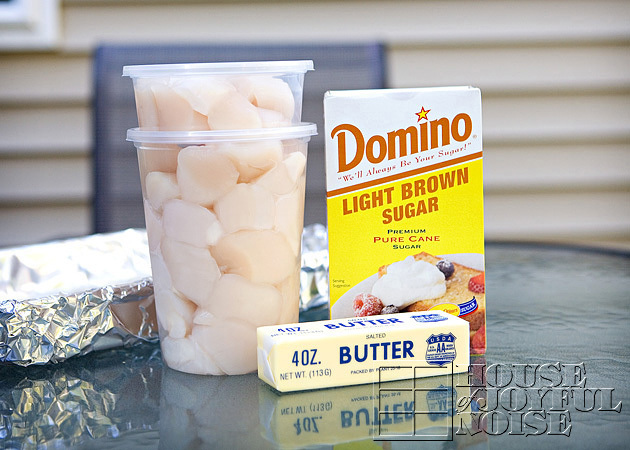 The scallops participating ingredients: fresh sea scallops (easy to find here on this shore), 1/2 stick of butter, and some light brown sugar. 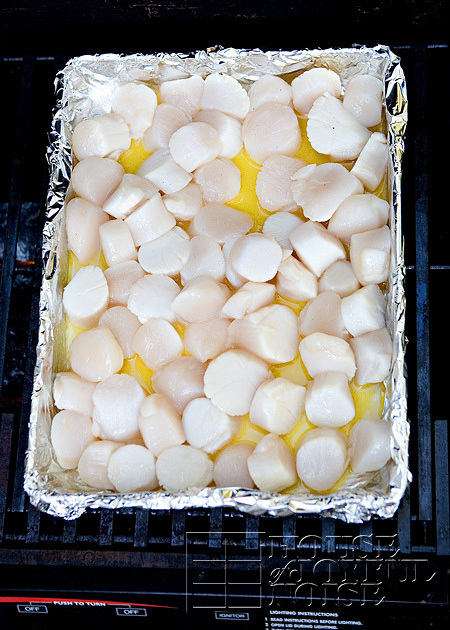 When the butter is all melted, dump in the fresh raw scallops. Spread them all out evenish in the pan, and close the cover. Get in there and stir them up now and then, turning the scallops over as you can. or even spinning the pan around to ensure even heating. 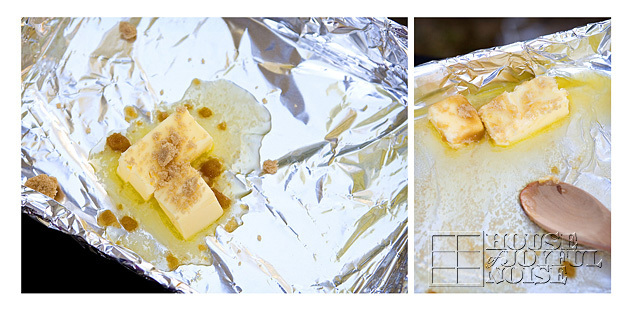 But the goal is to get the butter and sugar caramelizing, and that really takes a little bit of a while. Then we started preparing a side dish. 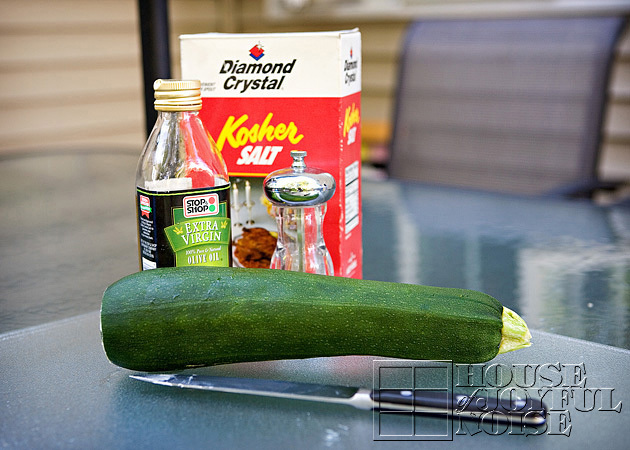 Participating ingredients: a garden-fresh zucchini, virgin olive oil, kosher salt and pepper. 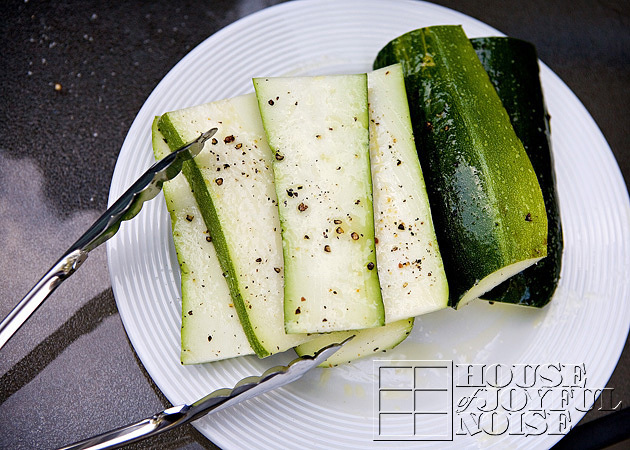 Cut off the ends of the zucchini, and then slice it up the long way, about 1/2 inches or there-abouts. Then we cut those slices in half too. 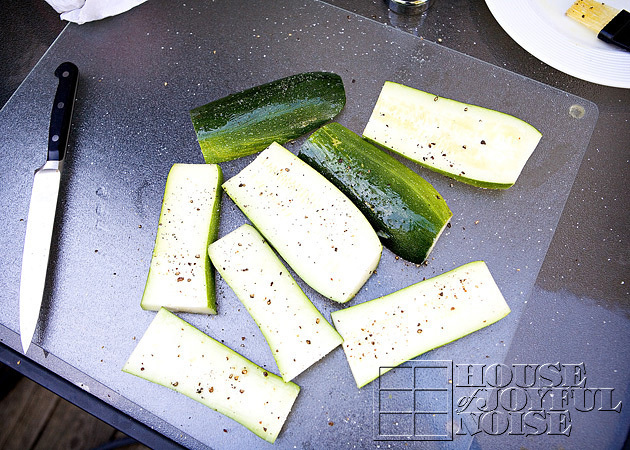 Brush them with olive oil, and sprinkle on some kosher salt and ground pepper > both sides. They are ready to throw on the grill. 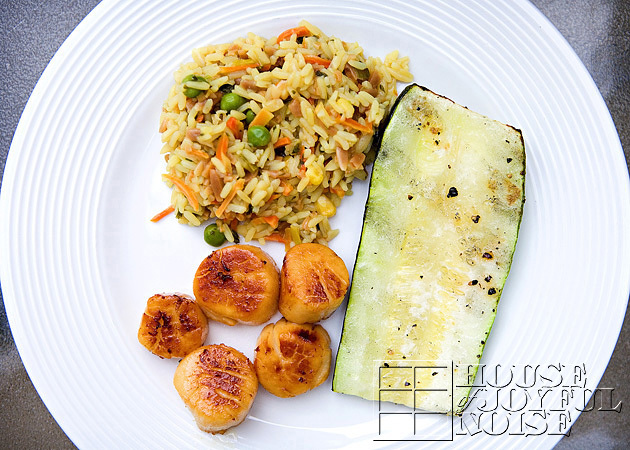 But the scallops take much longer, so we waited quite awhile before putting the zucchini on. 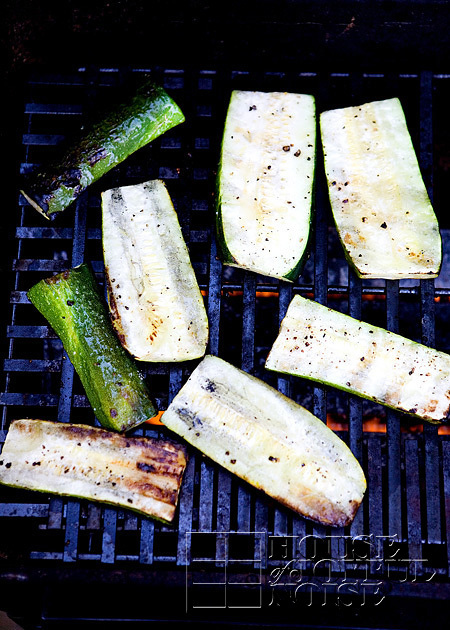 When the scallops looked like they would be ready soon, we threw the zucchini on the grill. 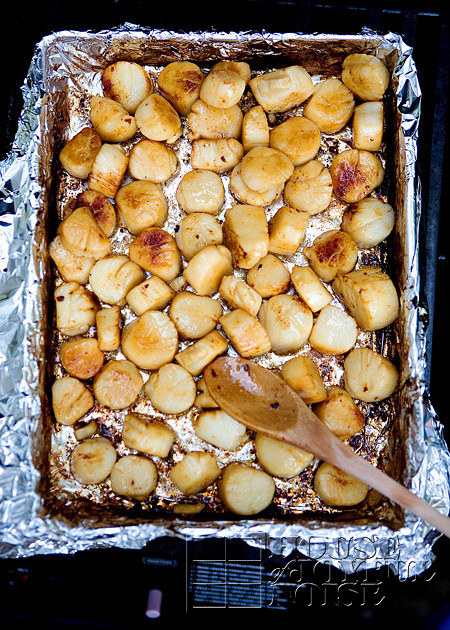 The goal for these is to remove them off the grill when they are still dense and soft, but on the firmer side. We don’t like mushy squash. 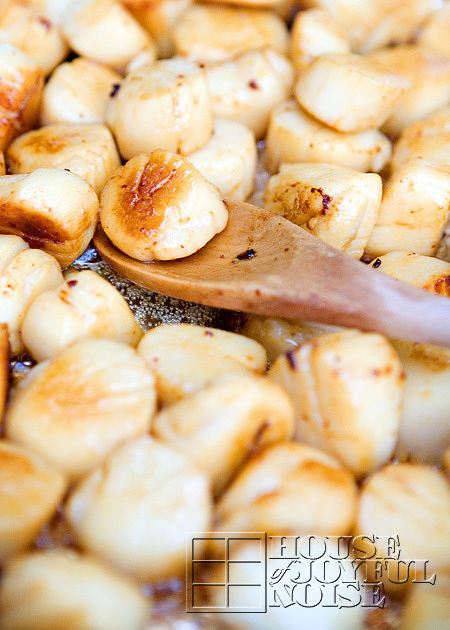 The scallops get beautifully brown, as all of the butter and sugar has caramelized. We also made a rice side dish. But don’t be too impressed with that. It was literally one of those ‘Side Dish’ packets. You know….add water and boil. But how simple and summery is this meal? It was SO good. The kids enjoyed it too, as suspicious as they were. We had scallops left over though, so Michael brought them to his friend. He was a very grateful man, from what I heard.